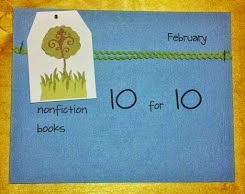 I'm joining Julie Balen and Mandy Roebuck and Cathy Mere for the nonfiction event #nf10for10. I'm putting together a top 10 nonfiction picture book list... with a theme! Visit Write at the Edge to jog to all the other 10 for 10 nonfiction picture book lists. Make sure you have a way to record all of the great books you'll want to check out! When I think of nonfiction picture books, or informational texts as we are referring to them now, I think of using them to teach content area subjects. I'm grouping mine together plus one extra! These women were fascinating to read about. I think they would be great reads, either in their entirety or in excerpts (particularly Josephine if you are using it with a younger audience). Goodreads review: In exuberant verse and stirring pictures, Patricia Hruby Powell and Christian Robinson create an extraordinary portrait of the passionate performer and civil rights advocate Josephine Baker, the woman who worked her way from the slums of St. Louis to the grandest stages in the world. Meticulously researched by both author and artist, Josephine's powerful story of struggle and triumph is an inspiration and a spectacle, just like the legend herself. Goodreads review: Zora and Langston. Billie and Bessie. Eubie and Duke. If the Harlem Renaissance had a court, they were its kings and queens. But there were other, lesser known individuals whose contributions were just as impactful, such as Florence Mills. Born to parents who were former-slaves Florence knew early on that she loved to sing. And that people really responded to her sweet, bird-like voice. Her dancing and singing catapulted her all the way to the stages of 1920s Broadway where she inspired songs and even entire plays! Yet with all this success, she knew firsthand how bigotry shaped her world. And when she was offered the role of a lifetime from Ziegfeld himself, she chose to support all-black musicals instead. Goodreads review: When Clara Lemlich arrived in America, she couldn't speak English. She didn't know that young women had to go to work, that they traded an education for long hours of labor, that she was expected to grow up fast. So Clara fought back. Fed up with the mistreatment of her fellow laborers, Clara led the largest walkout of women workers in the country's history. Clara had learned a lot from her short time in America. She learned that everyone deserved a fair chance. That you had to stand together and fight for what you wanted. And, most importantly, that you could do anything you put your mind to. Goodreads review: Once upon a time, American children couldn’t borrow library books. Reading wasn’t all that important for children, many thought. Luckily Miss Anne Carroll Moore thought otherwise! This is the true story of how Miss Moore created the first children’s room at the New York Public Library, a bright, warm room filled with artwork, window seats, and most important of all, borrowing privileges to the world’s best children’s books in many different languages. Goodreads review: Unearth the true story of green-thumbed pioneer and activist Kate Sessions, who helped San Diego grow from a dry desert town into a lush, leafy city known for its gorgeous parks and gardens.Katherine Olivia Sessions never thought she’d live in a place without trees. After all, Kate grew up among the towering pines and redwoods of Northern California. But after becoming the first woman to graduate from the University of California with a degree in science, she took a job as a teacher far south in the dry desert town of San Diego. Where there were almost no trees. I was a little worried with the size of this book. It's very big, very thick. I'm not much of an animal person, much less someone who would pick up an animal book to read. If it wasn't for the fact this was Steve Jenkins, would have probably skipped over it. The facts were fascinating. The amount of writing about each animal at a manageable size. The organization was impeccable. Kids can skip to certain parts that interest them the most. Read a few pages, read the whole section, or read the whole book. I think kids will enjoy looking at the illustrations (done in true Steve Jenkins style) and talk about the facts. Some are interesting, some are gross, some are unbelievable. Goodreads review: A sleepy bear awakes in spring and goes to find food. But what is there to eat in April? In May? Follow along and eat like a bear throughout the year: fish from a stream, ants from a tree, and delicious huckleberries from a bush. Fill up your belly and prepare for the long winter ahead, when you'll snuggle into your warm den and snore like a bear once again. My comments: I may be stretching this one a little into the nonfiction category, but I think this book is rich with details for the younger reader and gives great information about what a bear eats during the different season. Goodreads review: On August 29, 2005, Hurricane Katrina crashed a forty-foot tidal wave over the Marine Life Oceanarium in Gulfport, Mississippi. The dolphin house was demolished, and its inhabitants swept from their tank into the Gulf of Mexico. After growing up in captivity, how could the eight bottlenose dolphins feed and protect themselves in the wild? And if they could survive, would their trainers ever see them again? This fascinating picture book—enriched with both beautiful color-wash illustrations and photographs taken by the trainers themselves—tells this dramatic, happy-ending story. Goodreads review: Above the treetops of Puerto Rico flies a flock of parrots as green as their island home. . . . These are Puerto Rican parrots. They lived on this island for millions of years, and then they nearly vanished from the earth forever. Goodreads review: The Caldecott Medal Winner, Sibert Honor Book, and New York Timesbestseller Locomotive is a rich and detailed sensory exploration of America's early railroads, from the creator of the "stunning" (Booklist)Moonshot. Enjoy the blog hop! So many fantastic books out there, waiting to be read! Happy nonfiction reading! 4 day weekend... What does that mean? More reading time! I was extremely fortunate to attend Anderson Bookshop's Children's Literature Breakfast this weekend in Naperville. It was an amazing morning and it makes me so glad to live close enough to attend this annual event. I will post more about it later, as it's deserving of its own post! One of the wonderful things is the many books I was able to purchase before publication! Check these out and then check them out on their book birthday! My review: Great story for young readers that specifically tells a broad overview of Joe DiMaggio's hitting streak. The author includes great source notes at the end of the book - could be a mentor text to model how author's show how/where they get their information about a topic. Told in haiku verse, this story follows Koo, the panda bear, as he goes through the seasons. My review: A mom is talking to her young child, reminding him to mind his manners, pick up after himself, but always refers to him as "Destructosaurus"! The illustrations match the text so well with the broad sweeping lines of Destructosaurus and the bright colorful chaos he leaves in his wake. Young readers will really enjoy the illustrations and amusing text. And my favorite new book (thanks Dylan Teut!!! ), be sure to check this one out! My review: This is such a beautiful story! Maple gets her name from a maple tree her parents planted in her honor. She grows up with the tree and it becomes an important part of her life. And just as she notices a new seed growing, she gets to experience having a new baby sister, and see this little life grow! Maple helps take care of her new little sister, Willow, and shares the outside and her special tree with her. But the new little seed has grown and we see it is a willow tree. The story is sweet, but what got me are the illustrations. They are absolutely beautiful! I will spend many rereads of this book, specifically looking at the illustrations! I can't wait to see the sequel to this book! Now for the rest of the books I read this week! I love the Penguin stories. Great for young readers. This one was not my favorite but it would go well in a friendship unit. Squirrel!!! Even Daisy gets distracted by them! Cute, almost wordless picture book, would lend itself to some great discussions: being distracted, the feelings you have when lost, then found. I think a wordless unit would work well to talking about the illustrations and the craft that went into them - the medium used, how did it enhance the story telling? how did the illustrator communicate the character's feelings? Cute story. Good to read to explain a bad day! Good mentor text for how to use those things that happen to us - like having a bad day - and turn it into a good story. What an amazing book! I just can't get over the meticulous illustrations! Very informative and engaging stories about the parrots that have been living for millions of years in Puerto Rico and how they were almost driven to extinction. Great classroom uses - author's craft of using cause/effect... discussing the environment, how people and animals affect the world around them. The authors did a fantastic job adding addition information in the back, including real photographs and additional descriptions, a narrative timeline and sources. The best part is how the entire book is held sideways, top to bottom... not sure how you describe it! I think kids will really enjoy this one. This is a fantastic book to include in a classroom library. I think all students will enjoy it on some level. Kids will love this collection of car poetry! Their young imaginations will easily see the need for a car to use in the ocean or a hot dog car that when you're done using it you eat it! They will also enjoy the highly engaging and intricate illustrations. Can't wait to share this book with some young readers! So glad to have found this series! My review: I bought this book when it first came out. I love Kate DiCamillo's books. I was so excited to start this book. I tried to start it in December but my daughter snatched it out of my pile. After the Newbery announcement, I knew I needed to start it and soon. I have now finished it and my thoughts as a reader are, ehhh. I don't know if maybe I had built it up too much in my head before I started it and it could never meet those expectations.... Whatever it was, I never fell in love with the book. This is just my opinion and although it is certainly not the opinion of most, it just wasn't the book for me. With that said, I do think this book would work well in a classroom. There is quite a bit to analyze - the characters (look at the patterns and see what they tell you), the relationship between the characters, the use of words and word choice. I do think Ms. DiCamillo did an excellent job putting in the right words or the right sentence at the right time. Many times I thought - oh, that was a clever use of language! The sophisticated words she used would be an excellent study of using context clues to figure out meaning for a younger reader and for the older reader, the words would lead to a discussion of word choice and analyzing the patterns of similar words. I couldn't leave this review without some of my favorite quotes. As I said, Ms. DiCamillo did a remarkable job with a single sentence saying so much! pg. 157 "Shocking, really, that a romance novelist could be so inept at the language of the heart." pg. 174 "Talk about a sentence you could never predict you would say." LOVE that sentence!!!! But my absolute favorite line from this book was "Holy unexpected occurrences!" I'll be using that one! I'm finishing this one today! Tim Green is coming to visit our district in April. Very excited! I have heard of his books, but have not read any. I know he mostly appeals to the middle grade crowd. Have you read his books? Are they ok for 4th grade? 3rd grade? Let me know in the comments! Can't wait to see what everyone else is reading! World Read Aloud Day is on March 5. I strongly believe that reading begins with listening to stories read to you by someone who cares for you - hopefully it's a parent or grandparent or maybe a teacher or maybe an older sibling. Every child should feel what it's like to sit with someone they love and trust and listen to stories, many of them, and travel to new places, meet new friends, feel a roller coaster of emotions, but most of all, learn to love reading. 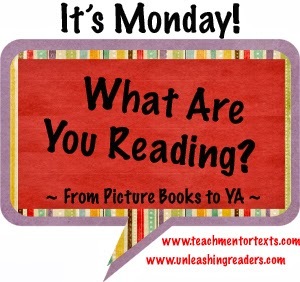 Week 1's challenge: What is your earliest or fondest memory in which someone read aloud to you? My earliest memory is listening to my dad read to me. I remember being very young, probably around 3, and my dad taking me to the local library. I can still remember him reading Flicka, Ricka and Dicka stories to me. I loved when he would change his voice to read Paul Galdone's The Three Billy Goats Gruff. He also read collections to me. I had a big book of Walt Disney stories. I loved picking out what story we were going to read. I think that's when "one more story, dad...." began! And I also started chapter books with him. I can remember sitting on his lap in our old rocking chair as he read the Christmas chapter to me from Laura Ingalls Wilder's Little House in the Big Woods. I was lucky that my dad came from a family of readers. His mom, my grandma, worked in a library. I benefitted from this as she would often send me books from the library. I remember opening a new treasure and waiting for him to come home and read to me. My grandma lives in New Mexico and I didn't see her very often growing up, but she would mail me books from time to time, which was very special. I didn't know it at the time, but she was introducing me to genres. She never referred to the books that way, but looking back, I can see that's how I first read fairy tales (Gyo Fujikawa's), holiday stories, and non-fiction collections. I learned about the different seasons and months and the "olden days" by reading Tasha Tudor's A Time to Keep. My grandma clearly instated a love of reading in my dad, which he passed on to me. I'm happy to pass this love of reading to my daughter. I started reading to her when she was a baby. I still try to read out loud with her from time to time, even though she is a very independent reader now. She still enjoys cuddling up with me and listening to a good story. It's a treasured time. Come back next week to see my interview with my daughter about reading! Our kindergarten teachers teach a unit on bears every winter. The students compare and contrast different types of bears, they read about them, research them, and watch live feed videos! I found a few new(er) books to add to their collection. I love how these newer books use accessible text for young readers and there is additional information utilized in the Author's Notes. Each of these three books also have different illustrations - ranging from real photographs, illustrations and Steve Jenkins's traditional artwork! Details the first three years of a brown bear's life. Wonderful details, great text for young readers, and fascinating photographs. Great book for young readers who are looking for information about brown bears, specifically their eating habits. I loved how this book showed through the months a brown bear spends on the prowl, how it finds food, what type of food it eats and how it looks for its food. Text that flows, yet it does not shy away from using some important vocabulary ("forage", "unearth", "talus slopes"). So much information can be taken from the story! The author includes additional information at the end of the book that goes into more depth about the eating habits of the brown bear. Informational text about polar bear cubs. Gives the reader information, not only about where polar bears live, but also additional information about global warming and the effect on the home of the polar bear. Having a 5 day work-week can really cramp the amount of reading you do in a week! Then throw a 3-day swim meet into the weekend, and it makes it really tough. I crammed a lot in on Sunday, so I think I came out ok :) Read some great informational texts, I'll feature those on some upcoming Wednesdays! Check out the post this coming Wednesday! I actually read this a few weeks ago. It somehow never made it on here or my Goodreads shelf! Loved this book. Can find so many uses for it. I think the kids will pour over the illustrations and stories. Yes, everything from last week! The Pure trilogy by Julianna Baggott has been so fun to read. She has had such a different look on the world-has-come-to-an-end society than other writers. The first book in the trilogy was ok. The ending picked up the pace and that is what made me continue the second book. I loved the second book, so I'm glad I stuck with the series! Now, it's on to the final book! The start has a good hook, so my fingers are crossed! This certainly felt like the longest week ever! First time we had a 5-day workday in weeks! We'll be at the pool all weekend (already started Friday night!) with swim meets, so it will also be a long weekend. Good thing I like being busy! Celebration #1: Books. I know we celebrate reading and books frequently, but I read some great books the last few weeks. I love new books. I love the smell of new books. I love opening up the spine of a new book for the first time. I love when I'm reading a book that is so good that I don't want it to end, and I start reading it slower when I get closer to the end. And then when I finish it, I have to stop what I'm doing and just think about it for awhile. I can't move on and start something new. I need to allow for a few minutes of closure. That's how it was when I finished A Snicker of Magic. And I was so super excited to see it featured at our Scholastic Book Fair next week. I ran into a 4th grade class to let them know it would be available. There are some very excited 4th graders! Celebration #2: Collaboration. I had a great week in one of our 4th grade classes this week. This particular class has become so into reading - they are talking about what they are reading and asking for suggestions. Their classroom teacher and I started a Book Talk Thursday time for them this week, and it's something we will continue to do on a weekly basis. We modeled it a little this week, and many of the kids are excited to get a chance to talk to each other about what they are reading next week. I was excited that the classroom teacher and I got a chance to bounce titles and discussion off each other. We had fun discussing Flora and Ulysses - "Holy unanticipated occurrences!" 1. Students will generate questions before and during their reading. 2. Students will write a summary of their reading and incorporate their thoughts and questions. We used the questioning technique that I had learned a few weeks prior. After reading a statement describing the book, students created a list of questions. I wanted their focus to be generating questions that would further/deepen their thinking when reading the text. After we had our list, we chose three questions that really focused on the story and would help us understand it better. I divided the book into half and read the first half and stopped to have students summarize their thinking. We have been using Sunday Cummins's book Close Reading with Informational Text to guide our non-fiction responses. Students made a "picture frame" outline on their paper and wrote their notes on the inside of the picture frame. Students wrote a summary, wrote if any answers to our questions had been found and if they had any other questions. The students shared (speaking and listening) with partners and then a few shared out whole group. We did the same process with the second half of the book, taking a little bit longer time looking at the answers to our questions. This book holds students attention and is a great story of survival. I was initially surprised that the main story used drawings instead of real photographs, but I guess a picture of the Oceanarium might not have been easy to photograph during a hurricane! The students really enjoyed the "scrapbook" at the end of the book with information about the dolphins and real photographs of the dolphins. Students also did routine writing, and worked on speaking and listening goals. Students were motivated by the topic and were easily engaged and wanted to share their thoughts. So many of our lessons seem to go that way when we found the right book! Can't wait to see all the other nonfiction books this week! "Holy Bagumba!" I read a lot of books this week! Thanks to 2 "Cold Days" of no school earlier in the week and a swim-meet free weekend, I read! I'm going to enjoy it because next week my daughter has a swim meet and she's swimming all 3 days, and I'm timing 2 of the 3 days. No reading then! That's ok. This week will hold me over! Here are categories of books I read this week. For more thorough reviews, please visit my goodreads page (see the link on the right side of the page). I actually had read The Watermelon Seed last August. Glad to see that I liked it back then too! Knock, Knock is an amazingly well told story, will really make older readers sit up and notice. Should have great discussions following a read of this book. I had read Journey sometime last year but never got around to reviewing it. It's such an amazing book. I would love to read it with my 1st graders, and then again with my 4th graders just to see how the conversation evolves! The Man With the Violin Where Do Polar Bears Live? This book was so amazing! My daughter and I read it for our first unofficial Mother/Daughter book club. We each have a copy of the book, we set a certain amount of chapters to read per night, and then come together to talk about what we read. I loved doing this with her! When I ask her about what she read, her usual response is, "I liked it." I'm working with her to try and get her to understand how you talk about a book, how you can mark something you like that you want to talk about. My favorite quote was when Carley was talking to Daniel about being brave. He said it was, "not being afraid of something." Carley's response, "No! It's being afraid and doing it anyway!" Do you use Beers' and Probst's Notice and Note lessons? Could that be a Words of the Wiser lesson??? I'm thinking that would be worth discussing! And here's a perfect Aha Moment, pg. 154, last two paragraphs - main sentence, "And as I listen, I realize that Toni and I feel the same way about things." This book was so amazing it's deemed worth of its own post! I'll hopefully have that up later this week. 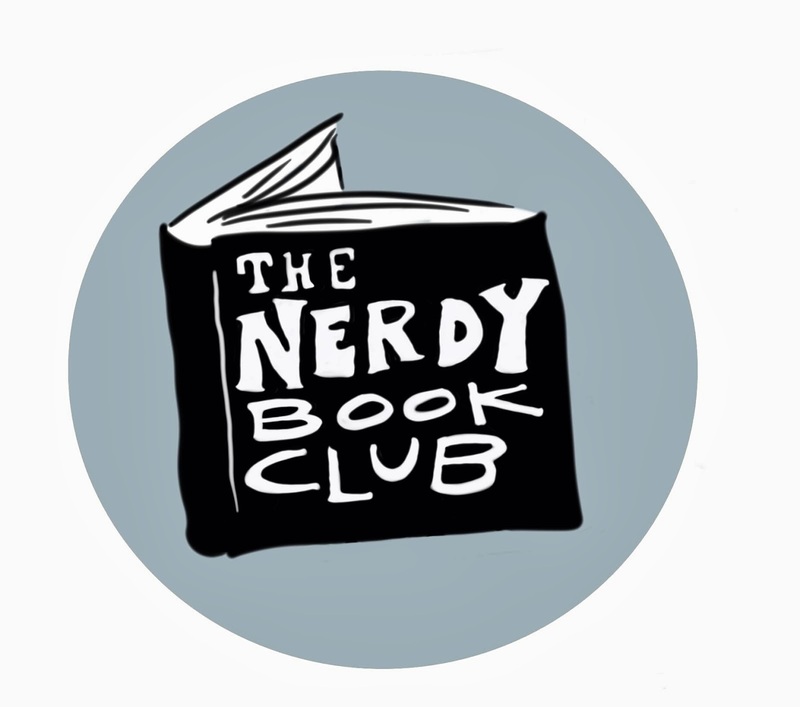 This is our next Mother/Daughter Book Club book! My daughter has it checked out from the library and I already owned it. We've decided upon 6 chapters/night. That will have us finish in time for the 3 week check-out period is over. I've heard great things about this book so I'm looking forward to starting it! Yes, the 2014 Newbery Medal Award winning book!!! I bought this book back when it first came out. We went on vacation in December and I brought it with me to read. And then my daughter took it from me. This happens frequently. When we sat and watched the 2014 ALA Awards live, we were both excited to see this book win. My daughter loved the story. I was a little jealous that she had read it and I had not. But that's ok. I'm glad she has such a love for reading. Now it's my turn. So, wow. Quite a few books this week! Won't see this amount again for awhile! So, what did you read? ?